Welcome, SYTYCD fans! If you remember, I am a contestant in the So You Think You Can Decorate competition hosted by Alchemy Junk. This is the kick-off post for Week 1 of the competition. The theme is Accessories. The first section of this post is my actual entry. In section two, I've included some additional photos and information just for you! And, in section three, there is a link for you to go vote for your favorite decorator project over at SYTYCD. Here is what was in the room already. This fabulous grey bench, with its weathered patina, is perfect along this long wall, and it is great for putting on shoes in the morning. The mirror, though unframed, adds a relaxed feel as it casually leans against the wall. Since all the light comes from two windows on the opposite wall, the mirror helps bounce additional light around the room. Would you agree that this wall still needed something though? 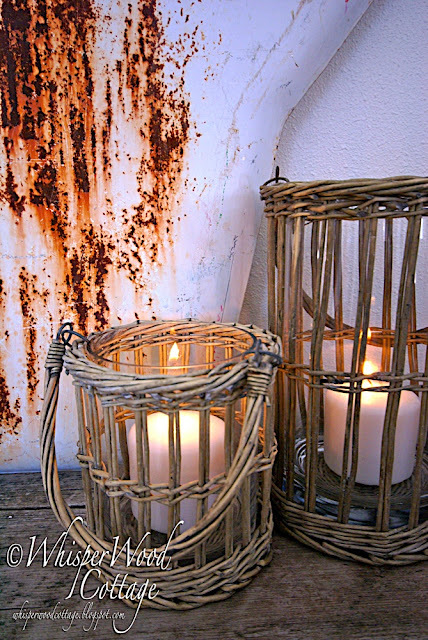 Here is where the grey basket lanterns and a rusty salvaged "Y" come into play. Like the mirror, the "Y" is simply leaning against the wall. 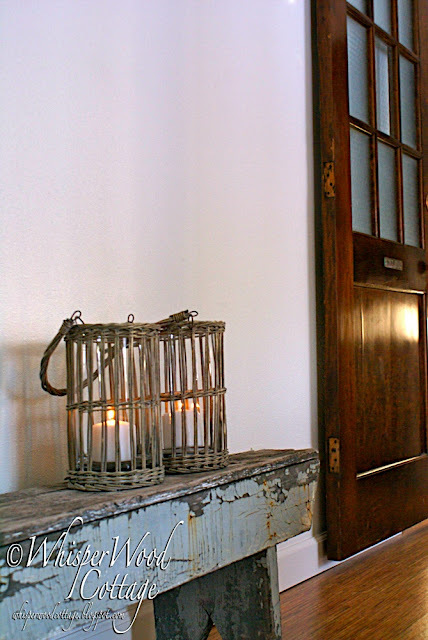 The lanterns, with a couple small candles, bring varying heights and some warmth to the space. Tanner was overseeing the project. Since he doesn't have thumbs, he is giving his ears up approval. 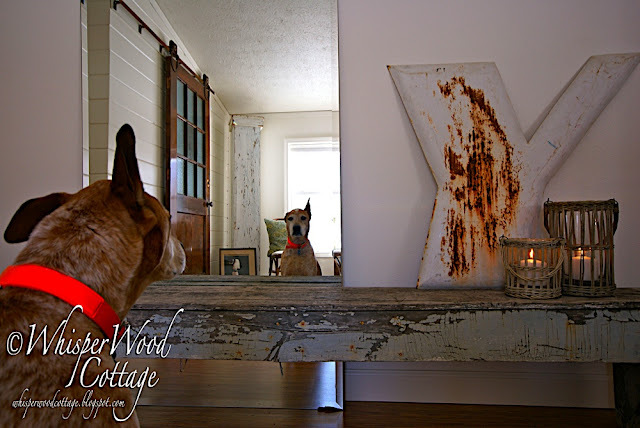 Mr. Greyhound (a rescued Greyhound bus sign) was hung just above the bench and mirror. I fell in love with him at Oronoco Gold Rush Days last August. The Greyhound sign reminds me of my own Tanner when he is out running at full speed...nothing makes him happier (except swimming!). Two lanterns, a big "Y", and a greyhound later, this formerly barren space has some casual character. My favorite part is that the neutrals in these three pieces blend well with the other colors and materials in the room. 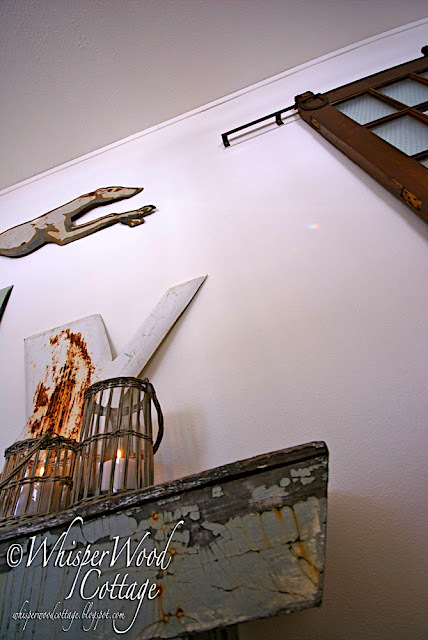 As usual, I love to mix unexpected industrial finds with earthy traditional pieces. You know I can't take only five photos of a space, right? Here are some more shots to whet your accessories whistle! 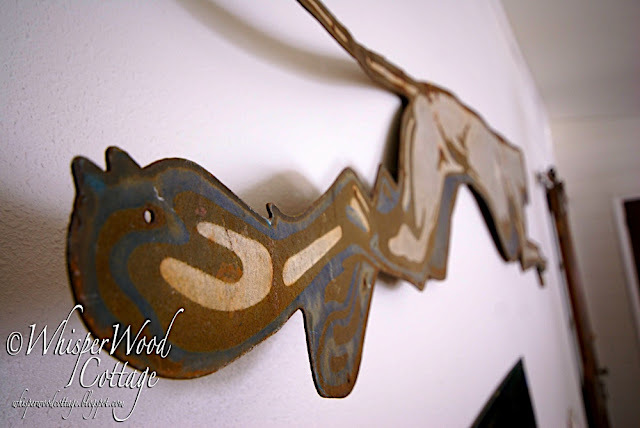 I adore unique finds...especially vintage/antique signs, rusty metal what-nots, weathered pieces, and junk that comes with a history or story attached to it. The greyhound draws me in on every level. A perfectly imperfect junk accessory. This "Y" actually has a special meaning for me. Remember my inspirational vintage toaster project that featured the phrase "question everything"? This "Y" is a lot like that in the sense that it acts as a "Why?" It reminds me to reflect on things daily...not in a negative sense of "Why did this happen to me?," but in a positive way that creates clarity and personal empowerment. 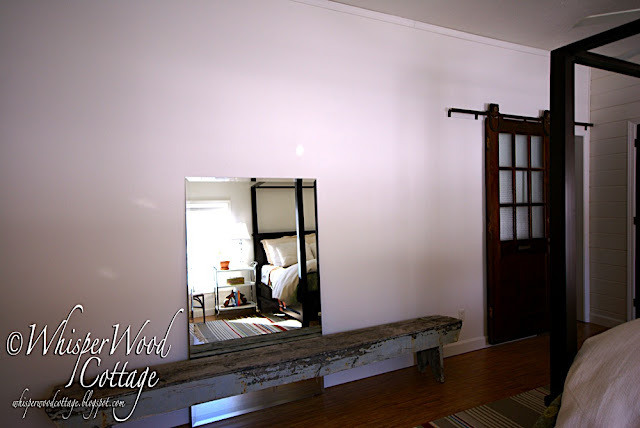 If you are curious about the barn-style door on the entry to the master bath, it is one of my favorite parts of our recent master bedroom makeover. There is a matching barn-style door on the entry to my walk-in closet. Both doors were rescued from a renovation project on a midwestern university campus. The look was inspired by the closet doors that junking guru, Sue Whitney of JUNKMARKET Style, put in her daughter's bedroom. Thanks, Sue, for your inspired design concept! If you would like to see who else inspires me, please visit my new Inspiration page. I've started a list of other bloggers who provide me with never-ending inspiration in terms of style, creativity, friendship, humor, spirit, etc. That is the true gift of blogging and junking...communities of people who make our lives better. Thank you to all the followers, subscribers, and commenters who visit me regularly. You add to my happiness! Head on over to SYTYCD to view the other entries and cast your vote! Voting polls are open until midnight (MST) on Friday, March 5. Amy! I am so inspired and impressed with your entry!! You have an amazing eye and I can't WAIT to see all that you come up with in the coming weeks! Wow, girl. I knew you'd have some outstanding kinda rustic to show. You didn't disappoint! Your entry shows amazing! Good for you!! Absolutely love it! I used to be a huge collector of old advertising. Your entry has me wondering why I stopped collecting. Just fabulous. Great accessories. 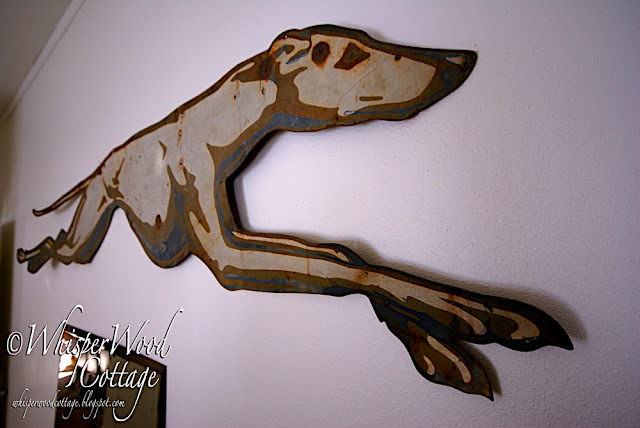 I love that big rusty greyhound sign. Greyhound was a major part of bus transportation when I was growing up. Amy, Your photography is just beautiful, first of all. Second, I love how you took some quirky pieces that wouldn't look special on their own and you elevated them in a way that is artsy, sophisticate, and fun. You have a perfect eye for this sort of thing and the guts to...well...follw your gut. Good for you! Good luck! Ha! Sorry about my type-o's. I'm tired. Amy....Amy.....Amy....wow. Love everything about your post. Tanner and Mr. Greyhound take the cake! Beautifully done...I do like your style, girl! Great job--that greyhound is so cool and unique! What a beautiful dog! (both of them). I am always amazed at the great finds you do. Why don't I ever find something cool like that? Love the look of the wall now! Amazing what 4 accessories did to that space - you have a great eye. I love everything about your bedroom - but that door in particular is the best! Well, maybe Tanner was actually the best. Your style is inspiring. Love all you've done, that bench is super awesome and the greyhound sign, priceless! I love it. 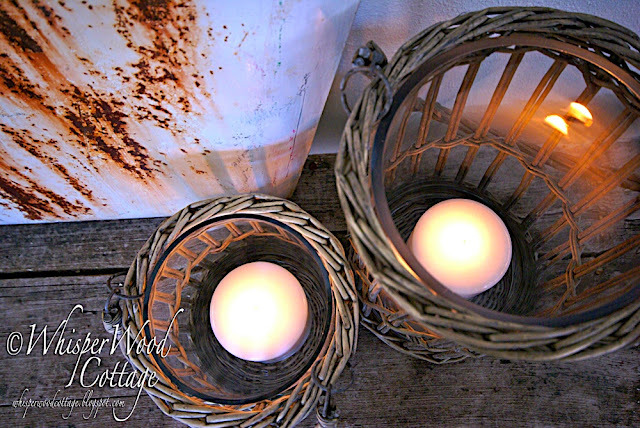 That Y is great along with the basket candle holders casting just the right light. The bench is spectacular with the mirror. Such simple beauty!!! It is gorgeous. Went right over and did some voting. So many great things. Is that a sliding door that you have in the background? I would love one of those in my bedroom. We sure need it. Would you mind sharing some info? I would really appreciate it. Awesome job Amy! You've got 1 of my 2 votes. Way to go girlfriend. It looks so personal and unique and the colors are my favs too. You are so good at that! I swear if I tried to decorate with those items (which I love) it would look like a rusty pile of junk. You have them arranged perfectly and it really shows off the character and beauty of each piece! I just love your junky, funky, puppy-dog accessories - awesome girl!!! Wonderful! Marvelous! Awesome! Bravo bravo bravo! Good work, Amy! LOVE the greyhound...and Tanner! Too cute! Gotta go vote! simple yet stunning says it all! 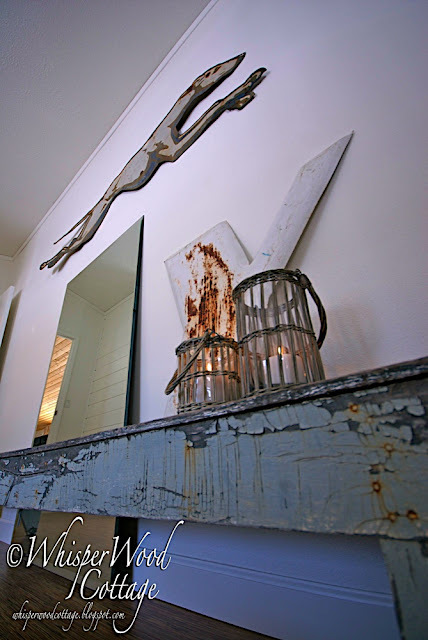 Hello Amy~I love your blog name of course.The master b/room is to die for.I am in LUST I have to say.Great job! I am off to TJ you know....to see if they have those basket lanterns love them.The old Greyhound sign is amazing great find as well as the bench.I also like lil reminders in life like your "Y" a simple thing but a good thought for everyday. I love everything about this room...every single piece. If only I could find that greyhound sign in the shape of a labrador! Seriously, this room is perfect. Do I detect a hint of a Texas drawl in that "y'all"? I do believe I do! I devoured every word and photo of this post. I love the lanterns...so much in fact, I'm going to my TJ's and see if they have them. I would love to own a greyhound like that...no mess! I didn't recognize my guy without clothes! P.S. You sweet thing...you inspire me! Amazing photos! Great job Amy!! 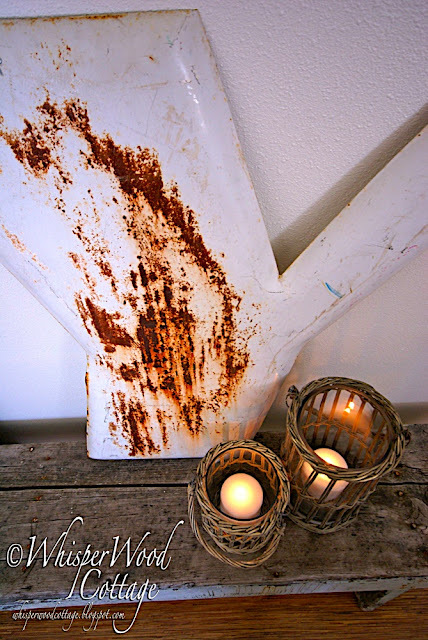 Amy - WOW - I love what you put together - rust and all!!! The greyhound is awesome, and really helps fill up the space. Love the picture of Tanner in the mirror - that's priceless!! Thanks for stopping by my blog, and can't wait to see y'all in Minnesota!!! Love the great job you did and objects you picked. That greyhound is sooo cool. And so is your Tanner!! That looks awesome! Love the greyhound and the Y. Very, very nice. 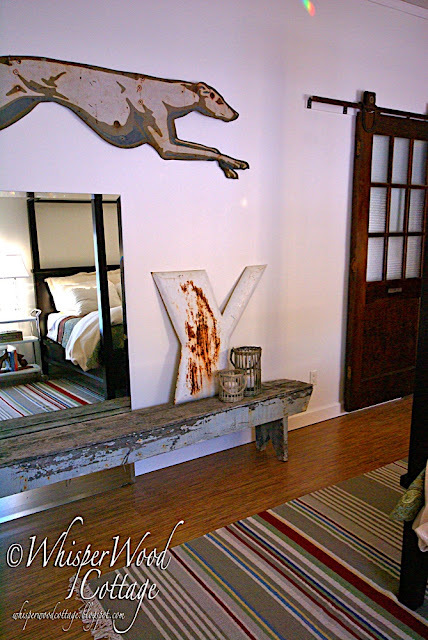 Love it all but oh, that Greyhound needs to come to Texas and live at my house! Wonderful piece! It is just all to die for! 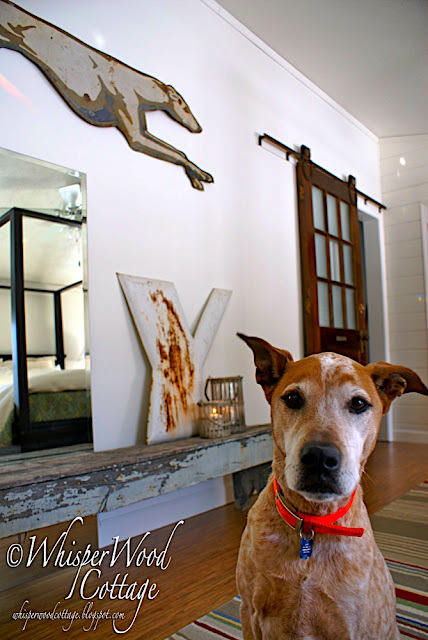 Oh how your doggie fits right in with that old weathered beachy look! Amy, I don't know why, but it's been a while since I've been here...I see I've missed some great stuff! I love your accessories! Even the bench has some rust running down from the old nails. Cool. Cool - cozy and rustic - gorgeous! I would love for you to come by to link this up to my party happening now! I would love to have you there!